This Fleximounts V1 full motion TV wall mount offers an attractive way to display a TV while also providing the most flexible viewing options. The arm can easily be adjusted, allowing you to watch your shows in a more comfortable, ergonomically correct position. 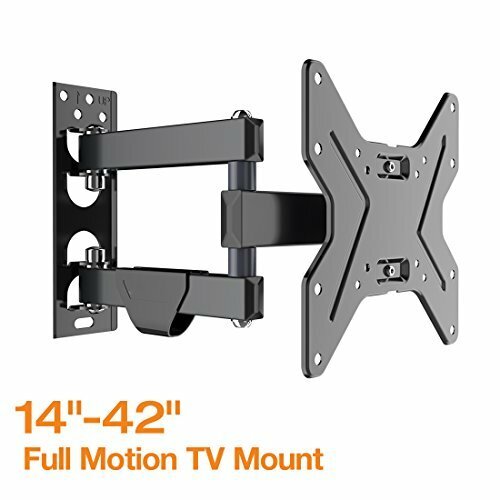 This TV wall mount can hold a flat screen TV between 17 and 42 inches with a max 200x200 VESA compatibility and 55lbs max loading capacity. This universal mount fits most TVs such as Samsung, LG, Vizio, TCL, Sharp, Sony, etc. 2. Tilt your TV for perfect viewing: Adjust the angle in every direction for easy viewing from any seat in the room. 3. Extended articulating system: Wide-angle swivel between -90 degree to +90 degree meets different viewing needs. The TV set can be manipulated in several positions to accommodate normal TV shows, video gaming, fitness programs, video chats and more. 5. Cable management system: Cables that would otherwise go astray can be concealed effectively making the whole TV set clean and tidy. 2. Compatible with VESA mounting hole pattern:75x75mm(3"x3"), 100X100mm(4"x4"), 200X100mm(8"x4"), 200X200mm(8"x8"). 5. Distance to the wall: 1.9"-15.4"
HIGH FLEXIBILITY: Easy to be manipulated in several positions includes wall corners to accommodate normal TV shows, video games, fitness programs, video chats, etc. FULL MOTION: Retracts to 1.9" to save space, extends fairly long 15.4" out from the wall. Tilt+10°/-5°, swivel 180° and rotation +/-3° for optimal viewing angle. SAFETY GUARANTEE: Pass 4 times weight loading test, up to 220 lbs (4 x55 lbs), making sure the TV is sturdy enough. PACKAGE INCLUDE: Incredible 10-Year Warranty, magnetic Bubble level, 6ft HDMI Cable and standard mounting hardware. PERLESMITH TV Wall Mount Bracket Full Motion, Tilts, Swivels Most 50-90 inch LED LCD OLED Flat Screen Plasma TVs Dual Articulating Arms, Holds up to 165lbs VESA 800x600mm,Max Stud Spacing 24"